Are you preparing your students for a long Winter Break? Do you want to actively engage your students in Math fluency over the Winter Break? If you said YES, there is a FREE Math packet cover and rubric for your students to complete and return after their Winter Break. 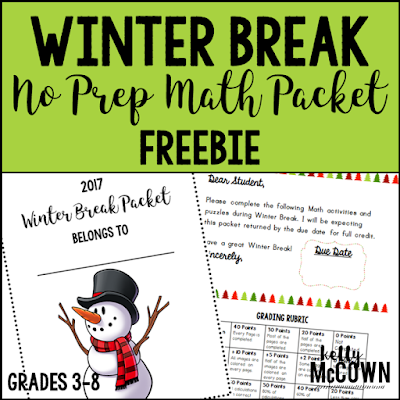 This Winter Break NO PREP Math packet that will keep your students engaged in Math over their break! 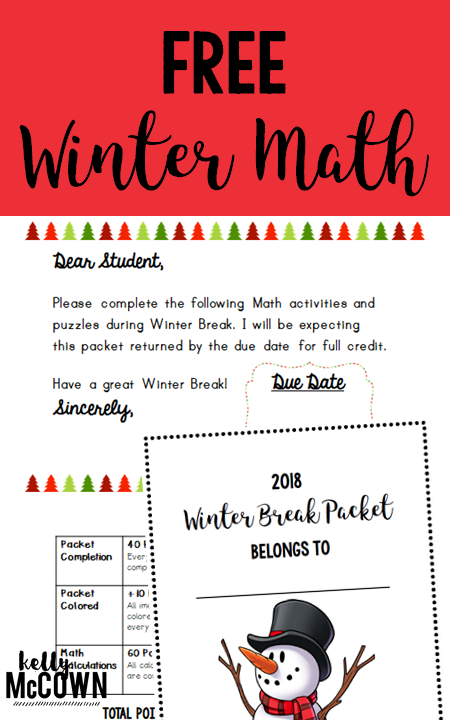 This packet is designed to be fun for students to complete and updated for 2018 Winter Break. Engaging your students in Math may be difficult this holiday season, but you can keep them actively involved with activities to use their critical thinking skills. Other teachers have said, "Thanks for the rubric - that is very helpful." "I do not send work home with my kiddos over breaks, but this will be handy as a "just in case" activity for a sub. Thank you!" Great for not just over the long winter break, teachers have used these puzzles for bell work, morning work, class work, and fast finishers to name a few! Encourage your students to have fun with Math and watch them succeed! !